Based on the Turing architecture, the MSI GeForce GTX 1660 Ti ARMOR OC Graphics Card provides improvements in performance, memory bandwidth, and power efficiency over its predecessor based on the Pascal architecture. For cooling, MSI implemented dual TORX 2.0 fans, which maximizes downwards airflow and air dispersion to the heat sink below them. 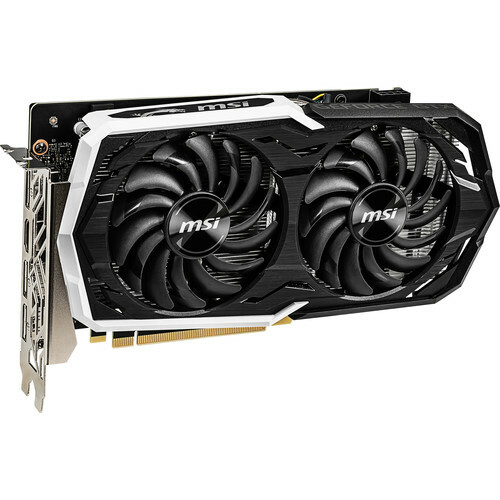 This GPU also utilizes MSI ZeroFrozr technology to eliminate fan noise by stopping the fans in low-load situations. Box Dimensions (LxWxH) 13.85 x 10.55 x 3.3"